See the American Museum of Natural History without the crowds, before it opens to the public. Our museum trained guides will take you on a fascinating tour of the Museum’s treasures. When the Museum opens to the public after your tour, you’ll have timed tickets to the spectacular Hayden Planetarium Space Show. Visit the American Museum of Natural History without the crowds on this 75-minute private VIP tour. This tour provides you exclusive access to the Natural History Museum before it opens to the general public where you will be taken on a fascinating tour of the Museum’s treasures. And, when the Museum opens to the public after your tour, you’ll have tickets to all the awe-inspiring Hayden Planetarium Space Show. Located in the heart of Manhattan, set across from beautiful Central Park, American Museum of Natural History is one of the world's greatest scientific and cultural institutions housed in one of the most architecturally magnificent buildings. On the morning of your tour you will enter through the security entrance underneath the plaza staircase towards a U shaped driveway down to a set of glass doors. Meet your museum trained guide at the security desk and begin your VIP tour. Delight in a multitude of permanent exhibits as well as the impressive Rose Center for Earth and Space. Discover the preeminent museum that continues to fascinate and enrich millions of visitors each year. 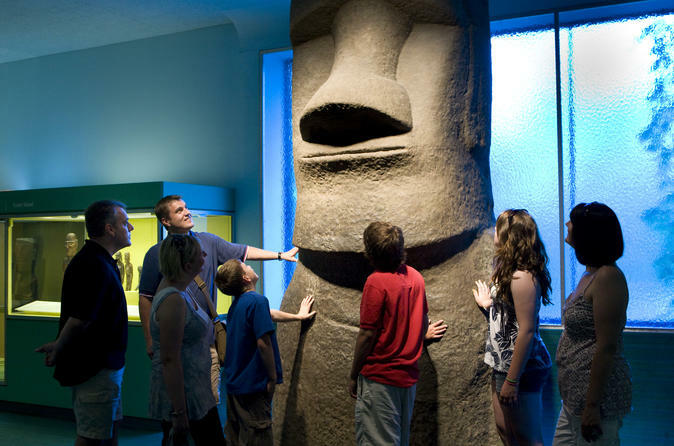 Kids will love the many inspirational displays featured in the film Night at the Museum including the the iconic Tyrannosaurus Rex skeleton on display in the Hall of Saurischian Dinosaurs and the Easter Island head in the Margaret Mead Hall of Pacific Peoples. Discover people the world with the vivid displays of the Cultural Halls examining the cultures of Asia, Africa, North and South America, and the Pacific. Explore the evolutionary story of the human family in the Hall of Human Origins. Dozens of exhibits from mammals, birds, natural history, biodiversity to dioramas and more await!